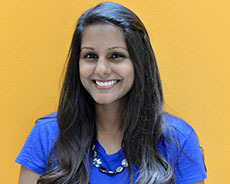 Nandini is a sixth year graduate student in Duke’s clinical psychology program, completing her internship year focusing in child psychology here at CHC and Stanford Children’s hospital. Her research focuses primarily on the impact of interpersonal impairment in Anorexia Nervosa. Specifically, she is investigating the nature of friendships and social cognition in individuals with Anorexia and the effectiveness of a meal replacement shake and its impact on food preoccupations. She is a California native: prior to moving to Durham, she worked at Stanford’s Eating Disorder Lab as a research assistant. Nandini is very excited to have back her 365 days of sun! She enjoys spending as much of her spare time as she can with her two pups: Lokhi and Bailey.